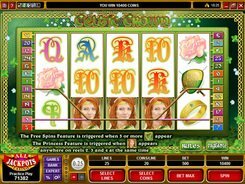 Treasure Nile is a progressive slot equipped with 5 reels and 9 paylines, and is one of the few slots that pays left to right AND right to left. 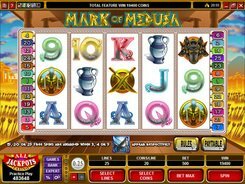 The slot is based on an Ancient Egyptian theme, and its symbols include ankhs, sphinxes, Osiris, and other icons that are normally associated with that ancient civilization. A coin value comes fixed at $0.5, with a single coin accepted per line, so the only setting you can adjust is the number of paylines. 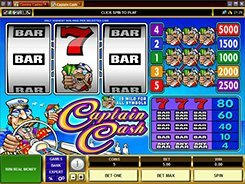 If you want to stand the chance of winning a progressive jackpot, then you need to activate all paylines by placing a $4.5 bet per spin. 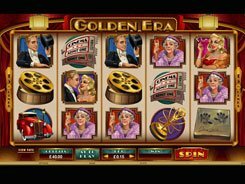 The jackpot amount is shown in a meter above the reels, which allows you to keep track of it. 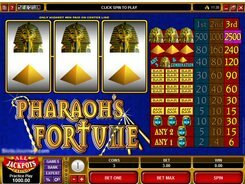 The life-changing jackpot will be yours if you land five Pharaoh symbols on line 9. Hitting the same combination on any other payline awards $3000. 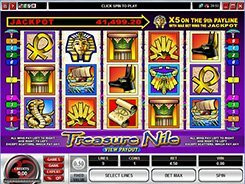 Along with the progressive jackpot, Treasure Nile also features a wild and a scatter. A wild symbol depicted by pyramids substitutes for all regular icons, but it cannot complete a jackpot progressive win. 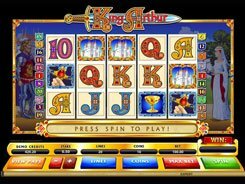 A scatter which is the Scarab pays out $22.5 to $225, should three, four or five appear anywhere in view. PLAY FOR REAL MONEY!